2018 Nashville Navy Party Details! Current lineup includes: Darryl Worley, Halfway 2 Hazard, Jeff Bates, Danielle Peck, Jaime Fox, Desert Okies, and more to be announced! 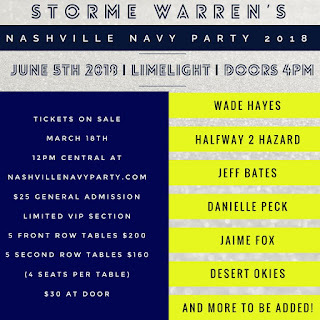 Note: Wade Hayes has cancelled his appearance due to a scheduling conflict.